The StoreVent building ventilation system has been specially designed to maximise the efficiency of crop cooling and drying systems. It improves crop store ventilation by expelling warm, moist air and replacing it with fresh, cool air. The StoreVent building ventilation system includes high volume belt-drive fans and fixed blade intake louvres which are matched in size and quantity to the amount of air expelled from Pile-Dry Fans and other cooling and drying systems used in typical crop storage situations. Why use the Martin Lishman StoreVent system in your crop store? StoreVent maximises the efficiency of your crop cooling and drying systems. StoreVent matches the size of extraction fan and air intake to the amount of air expelled from Pile-Dry crop ventilating fans. StoreVent increases cooling speed, reduces energy consumption, reduces the chance of insect infestation and improves the quality of your grain. Why ventilate your crop store? Many agricultural buildings have inadequate external ventilation, or none at all. This makes crop cooling systems inefficient because warm air extracted from the grain is circulated within the building rather than being expelled. The result is poor energy efficiency and slow cooling speeds. Condensation can occur inside the building giving a higher potential for insect infestation and lower quality grain. Leaving the doors open can help the situation, but there is still no through-flow of fresh air. This also increases the security risk at remote sites and is non-compliant with quality assurance schemes since birds and vermin can enter the store. StoreVent removes all these risks and ensures maximum energy and cooling efficiency from your crop ventilation system. How do I install a StoreVent system? StoreVent system components should be installed to take the best advantage of prevailing winds and the airflow generated by crop ventilation systems. Intake louvres should be installed (usually above the door) so that the prevailing wind can enter through the louvre. Extraction fans should be installed at the opposite end or side of the building. Louvres and fans should not be used in the same wall. Pile-Dry Fans located on Martin Lishman grain pedestals should be pointed towards the extraction fan. This assists the flow of air across the grain so that fresh cool air enters through the louvre and warm wet air is extracted by the fan. Installation of StoreVent components must be carried out by competent engineers in accordance with all statutory electrical and health and safety regulations. StoreVent has been designed, with different sizes and quantities of intake louvre and extraction fan, to match the number of Pile-Dry Pedestal fans likely to be used in a crop store. The design ensures the amount of air extracted from the grain is expelled from the building and replaced with fresh air. It takes into account the volume of grain in the building rather than the amount of internal space and ensures sufficient air exchange to maximise the cooling and drying effect of the ambient air. StoreVent works equally well with all types of crop ventilation and drying systems, including underfloor ducts, using the same design principles. Operation of StoreVent extraction fans can be linked to any of the Martin Lishman Automatic Fan Control Systems, including Barn Owl Wireless. 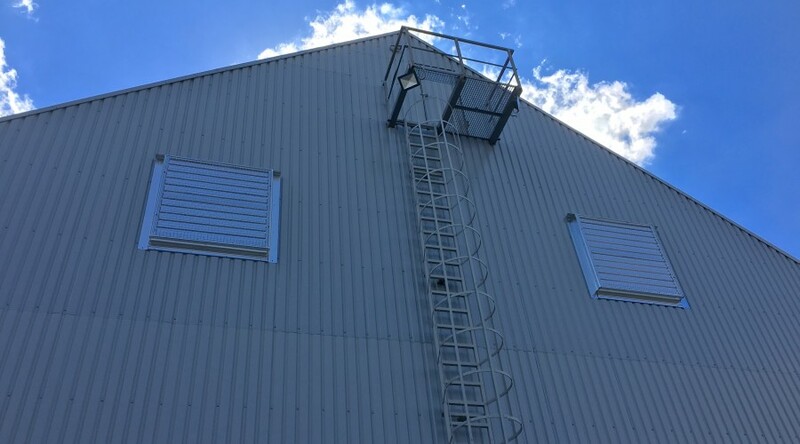 Enabling warm, moist air to be extracted from the building as it is extracted from the grain provides the most energy efficient way to operate your crop store. StoreVent fans can also be used in manual mode for dust extraction when loading and unloading a store. Click on the links below to move to the other steps towards a professional crop storage system.